Flipkart comes with a Mega Cash back offer for its exclusive device Moto G.
Now Shop Moto G 16 GB and 8 GB at 10 % discount as cashback. Save upto Rs.2400 on your Moto G purchase. 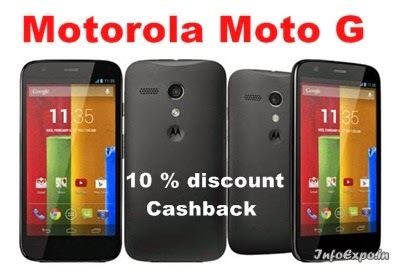 The 10 % cashback offer is valid for your Moto G purchase from 16th June to 25th June 2014. The offer is available for the purchase of Moto G with Standard Chartered Debit / Credit Cards. This is a limited period offer and valid till 25 th June 2014.